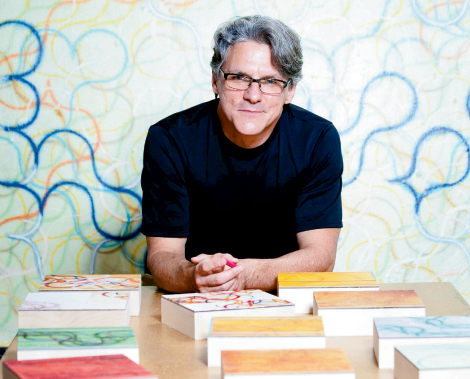 Abstract artist Kenn Kotara had a difficult time finding his path. “I started drawing as a child, and it always was a passion for me. But my father was very pragmatic,” recalls the Asheville artist. “He thought I should have a profession, a nine-to-five job that paid well.” After a short stint studying architecture, Kotara took his first drawing class at 28 and emerged with a master’s in fine arts from Louisiana Tech University. The category that makes up his largest body of work involves curvilinear lines that seem random, spontaneous, and even aimless. However, every twist and turn is calculated. He begins each painting by creating a grid on the canvas and using the same dimensions for each circle. Kotara creates with a continuous awareness of positive and negative space, believing that empty space is important to composition. A fan of transcendentalist Henry David Thoreau, Kotara read On Walden Pond and then created artwork on paper for each of the 18 chapters. Each is comprised of two stacked color panels imprinted with braille. These braille pieces reveal the thoughtful, multidimensional side of Kotara who has deep frustrations concerning the U.S. social and political systems. He chooses words and phrases from documents that are fundamental to the American political experience, such as the Magna Carta, and from the writings of persons he admires, such as Thoreau and Martin Luther King Jr.
Kotara is represented by Gallery Minerva in Asheville, Flanders Gallery in Raleigh, and Sandler Hudson Gallery in Atlanta.